Acquisition of a coveted wedding facility is a primary step when planning a wedding, and several key characteristics brides and grooms seek out during their scrutinizing pursuit are a beguiling yet economically priced venue and, preferably, one that is able to host both the ceremony and reception in adjoining areas. Opportunely, if a destination Tahoe wedding is in the making, the quest for a premier spot to celebrate a truly special day that comprises these anticipated qualities can be brought to fruition at Tahoe Paradise Park, an enchanting place found in the City of Meyers, a small mountain town set in the vicinity of acclaimed Lake Tahoe. 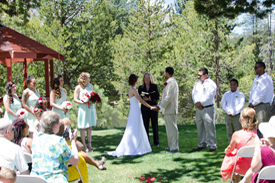 Serenely resting contiguous with Lake Baron, which is an offshoot of the Upper Truckee River, Lake Tahoe’s largest tributary, this hidden yet delightful spot is available throughout the summer season for weddings and special events. 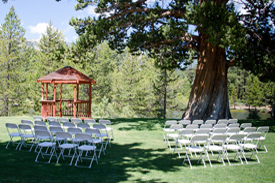 Tahoe Paradise Park offers two outdoor areas for the ceremony – next to the 1,000 year old cedar tree or aside the wooden gazebo. In addition, the park boasts a nearby spacious rec hall for a rousing celebration once the marriage rite has consummated. Some amenities of the hall include a capacious interior, a small kitchenette for food prep or storage, access to the adjacent outdoor patio area (which is part of the deal when you secure the reservation), and attention-grabbing views of the amazing Sierra Nevada Mountain Range that engulfs the park. Since the park doesn’t provide in-house catering, you are free to select a caterer of choice, an option couple’s naturally are inclined to favor. Similarly, entertainment election can be attuned to your preference as well. 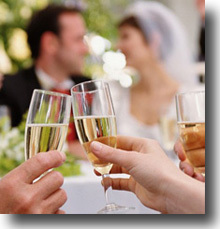 Moreover, a supplementary benefit obtained with the arrangement of this nonpareil locality is that it’s affordably priced, a price many brides and grooms find pleasantly pleasing, especially when they’re given the convenience of having the outdoor ceremonial site just steps away from the banquet room. 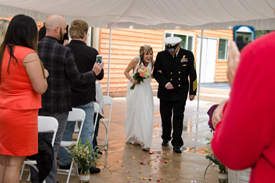 Searching for the ideal spot that grants the benefits of having both the ceremony and reception site at one location coupled with a thrifty price tag yet maintaining attributes that rival comparable higher priced venues can surely be realized at Tahoe Paradise Park. The totality of advantages the park delivers is certain to please the most expecting, providing assurance that a significant event in your life will transpire appealingly and, conceivably, beyond the envisioned. 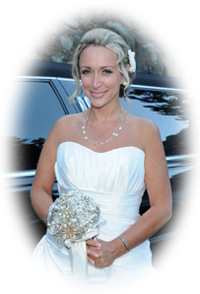 If interested in discovering other wedding sites in South Lake Tahoe please visit our venues page on our website. This entry was posted in Lake Tahoe Weddings, Prodigious Wedding Venues. Bookmark the permalink.